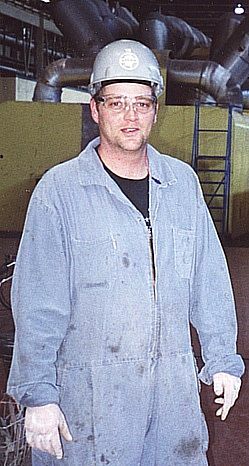 Mike was a very content towmotor operator in Ford Canada's Oakville Truck Plant . Content until he noticed that the Millwrights were continually installing machinery and robots designed to automatically transfer the same pallets his shift was transfering manually. "Ya , I didn't need an engine block to fall on my head to make me realize that I should maybe get a little job security going" . Why the Laborer's Union Mike ? "Well , I have always loved working with my hands and the Laborer Union seemed a great opportunity to move around , learn some new things and meet people from all walks of life" . Is it a boring trade ? "Hell no" , Steve responds ,"it's the complete opposite of boring , in fact . We do hundreds of tasks , in hundreds of places" . Hmmm , sounds a lot like Construction Millwrighting , Mike . "Yep , no doubt" , he replies , "in my humble opinion , the Construction Trades offer the best alternative to those that are seeking a more interesting way of life , and are not feeling the insecurities of being 'in-between' assignments when a project is finalized" . Well put , Mike . Couldn't have said it better myself .